Don’t let the thought of getting fit overwhelm you. You don’t have to do everything at once. 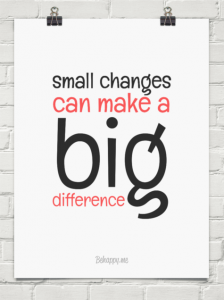 You can start by making small changes that are easy and continually add to those changes as they become habits. In the end, the more you take the more difference it makes to see big results. For instance, starting with just switching out water for soft drinks can save one hundred calories every time you do. Soft drinks—even diet soft drinks—have been linked to visceral fat—belly fat, which is the most dangerous type of fat. Make it a point to have bottles of water ready to quench your thirst. You don’t have to start a formal exercise program to reap benefits from moving more. Park further away from the door at the grocery or the mall and walk a bit. Take the stairs rather than the elevator—at least for one flight of stairs. If there are several flights, slowly build up until you can do them all. It’s easier to walk downstairs for most people, if you have to start by doing only that, go for it! Make it a habit to move at least five minutes every hour if you have a desk job. It’s not a crime to get hungry between meals, nor is it unhealthy to eat between meals, as long as you eat healthy. Carry fruit for snacks or a bag of healthy nuts. There are a number of healthy snacks you can have ready for those times you need a boost or have to tame a ravenous appetite. Air popped popcorn, yogurt, edamame, trail mix and feta on tomato slices are examples of food that can help keep the hunger monster from overtaking your body. Learn a short exercise routine and do part of it throughout the day. Who says you have to workout straight for a half hour or hour. You can break up that exercise routine to three or four smaller sections, until you’re ready to do a full half hour. It’s particularly helpful to do that if you have one of those super rushed days when you only have a few ten minute breaks sprinkled through it and can keep you on schedule for your workout. Sticking with a program of exercise isn’t always easy, but it’s so worth it. Start replacing unhealthy foods with healthy ones. You don’t have to change everything at once. As your palate adjusts. Get a good night’s rest. Set your alarm to remind you to go to bed, rather than falling asleep in a chair in front of the TV. If you’re a night owl, do it in small increments. Take a walk to the restaurant for lunch or pack your lunch and walk to a park to eat. Getting away from the office and enjoying a brisk walk can help clear your head and make you healthier. Walk a little faster. That’s right! Studies show that people who walk fast live longer.